Another month has come and gone! 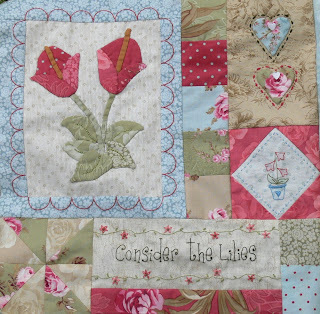 Have you been able to work on your Consider the Lilies block? I have Pattern 3 for you today. Go here to download it. A little bit of stitching and some applique are the treats for you this month. I added some sweet little pearl hearts as embellishment here. You might like to try some water colour pencils to add some colour to your pot of lilies. 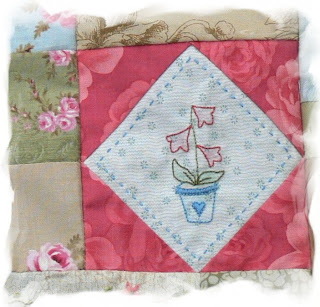 If you have any problems making this 'square in a square' pot of lilies block, there are many good websites with lots of diagrams and photos, so I decided not to duplicate what is already there. If you need help in finding a good site, send me an e-mail and I can direct you. which is the completed Block 1. Finish this one, and you are a quarter of the way there! 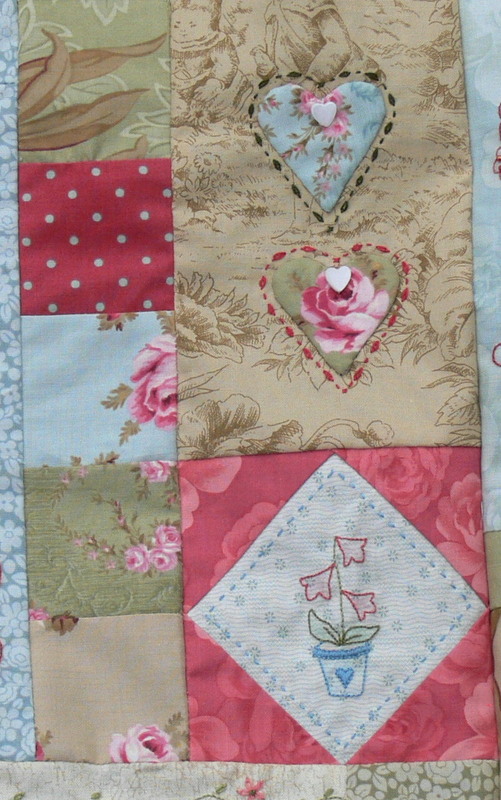 I managed to finish another of my 'half finished' items this week including the instructions etc﻿. Yeah!!! It too was commissioned by a magazine, which always makes me happy! So now I am on one of my 'half started' projects. It's a wall-hanging for a toddler. I always enjoy making children's designs. 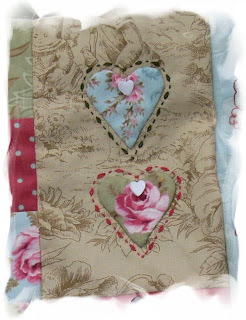 I do have another 'half finished' project on the go, but it is at the stage where it is ready for lots of embroidery, which I love to do at night. The wall-hanging needs lots of machine work and that's what I like to do when I have time during the day, so I have allowed myself to pick up another project, even though the other one isn't finished! You see, I am really trying to be disciplined! We enjoyed having four of our grandchildren and our daughter here over the weekend. We love being able to see our family so much more often that we used to. Then this afternoon, the Brisbane Symphony Orchestra came to our little township and put on a fantastic classical concert. My husband and I haven't been to one of these concerts for years, so it was just wonderful to sit back and allow the beautiful music to flow over our souls. There's nothing like being there - it is always just so much better than just listening to a CD! 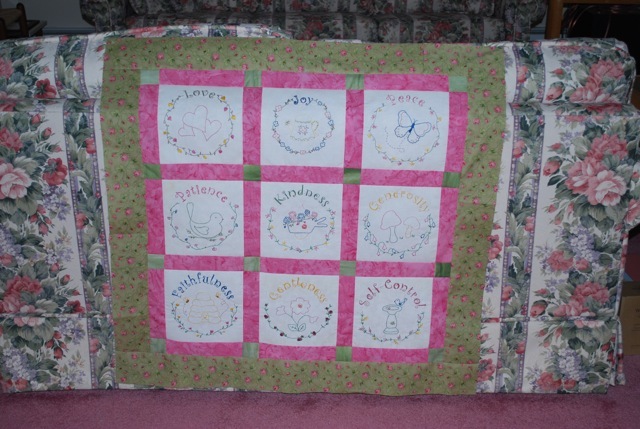 Now to show you what Ginny has done with the Gifts of Grace free design from 2010. Isn't this all-embroidered version sweet? Have a great week ... and happy stitching! Oh it is beautiful! Thank you! I am still working on finishing up the first part..LOL, my eyes were too big for my crafting stomach this year! I started on a wall-hanging that I am making for my hubbie celebrating his Irish heritage with lots of embroidery blocks so that has consumed my time. Once this is done Consider the Lilies is next. I love your pictures of it! HOW SWEET! Val I love it - I do like the colored pencil effect, I'll have to pull mine out. Thank you so much! Good for you on getting things done. I like to do my handwork at night too. The concert sounds wonderful, I used to love rock n' roll but now I'm a classical music fan...don't know much about it but I know what I like, lol. Ginny did a beautiful job with your Gifts of Grace! THanks Val for the 3rd block. I haven't started any yet but they are on my "to do " list for this year. So pretty! Thank you so much for the 3rd block of 'Consider the Lilies'. I try very hard to find time to start on it. It is so beautiful. 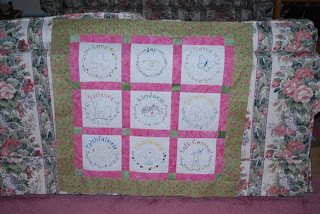 I have Part A and B pieced together, and just started on the embroidery for B. (Yes, I'm procrastinating on the applique for A.) Can't wait to get the whole block together. If it comes out good, I'll send you a photo. Thanks for sharing your pattern with us. I was drawn to it because of the scriptural quote. I would love to do the "Consider the Lillies" quilt but when I try to get the pattern I only get a picture. Am I doing something wrong ?????? You need to click the word "here" above to get to the link page. E-mail me if you still have problems as I can't contact you from your comment.